Here's a terrific photo of Houdini shooting The Man From Beyond on the rapids of the Niagara River. This comes from the April 15, 1922 Motion Picture News. I've never seen this shot. What excites me here is the bridge visible in the background with what appears to be people watching the shoot. This is not seen in the film. Indeed, in the movie there are no clear landmarks to tell us exactly where Houdini filmed these scenes. But this bridge is a landmark! Unfortunately, I've not been able to identify it. 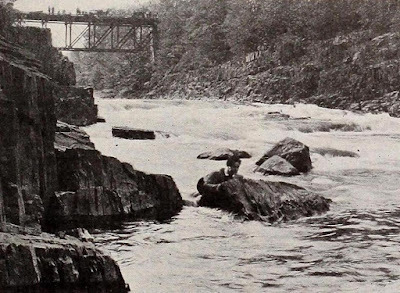 But if we could, we could potentially zero in on the exact spot where Houdini took his famous rapids ride. So does anyone recognize "Houdini Bridge"? There are a few candidates I see here. There's the small bridge between Green Island and Goat Island. Or the even smaller bridges on the other side of Goat Island connecting it to Three Sisters Island. Wonderful photo; thank you for sharing. I took a lot of video including overhead footage of the whole Falls area when I visited in order to go to the Houdini Magical Hall of Fame. I'll try and dig it out to see if that bridge is visible in any of it. Speaking of the museum, I don't recall seeing a specific reference to Houdini having filmed at the Falls on display in the Hall of Fame, but surely there must've been something there? I don't recall anything. That place wasn't much of a history museum. You know, I'm thinking some kind of 100th anniversary event and exhibition would be nice. It's just a couple years away. Great idea. There must be someplace suitable in the town for such an exhibition. In Scranton at the Houdini Museum we have at least 2 displays referencing Houdini’s filming at Niagara Falls and The Man From Beyond.